As soon as we had bought the apartment, we knew that we would need an architect. Fitting everything in was going to be a problem, and it all needed to be precisely done. It's also useful to have someone to liaise with the contractors so you don't have all that hassle. After asking around, we finally opted for the colleague of a friend of a friend. From the very first meeting we got on really well. Please meet... Dorothée Février ! 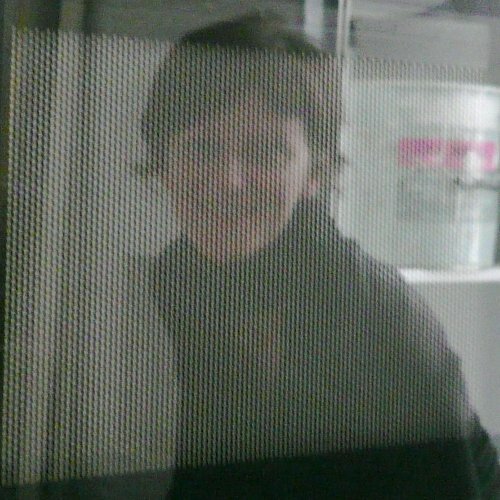 This is the only photo of Dorothée that I have: her doing a monkey face, reflected in the microwave with a plastic bucket behind her. Not the most glamorous shot ever, but she declined to give me anything else, so it will have to do! Dorothy works as an architect, but occasionally takes on personal projects to help people out. She was incredibly patient and understanding while we changed our minds, argued amongst ourselves, etc. She was available when necessary, even for Saturday shopping trips for certains items. She also took it very well when we rejected her first proposed layout for the apartment, realising - as we did - that it just wouldn't leave us enough space. What was the biggest challenge in the apartment? Arranging the kitchen and bathroom, definitely! Fitting them in to a 7m² space together with the entrance gave me some tense moments. Anything that you would have done differently had it been your apartment? I'd never really thought about it before, as the idea was to meet your requirements, not mine. The differences would have been more in the ambience and colours than the way the space was laid out, as that's more or less dictated by the architecture. An element that you didn't think would be any good but turned out well? A lesson learnt during the work? I learn something on every project, but here it was handling the space problems, both from a technical and organisational point of view. 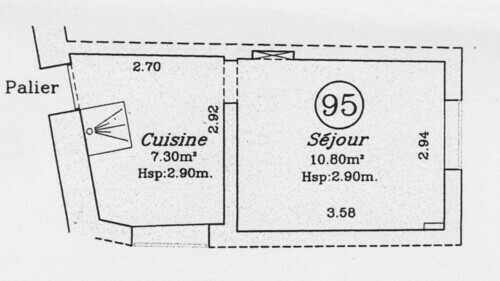 Original floorplan of the empty apartment. And that's it! Short but sweet interview. It was a really good experience working with Dorothée, and if the apartment looks as good as does to day, we partly have her to thank for it. Coming soon... an interview with ournotoriously shy contractors, Véli and Boris. Wish me luck!